I’ll start with the good news first. 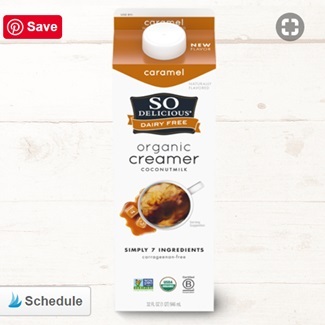 They’ve added Caramel to the So Delicious Coconut Milk Creamer flavors! The bad news is they have discontinued the Hazelnut flavor. And the meh news is that they have changed the packaging for the umpteenth time. We liked the prior packaging a lot better. It was cheerful and eye-catching. But minimalist seems to be what’s trending. And maybe you like the new cartons better! 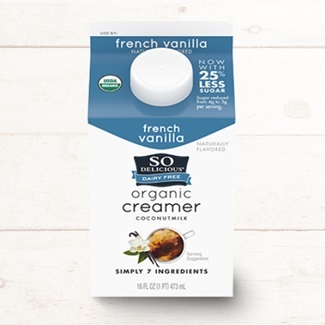 So Delicious Coconut Milk Creamer was one of the first truly dairy free creamers to hit the market, with no caseinates in sight. 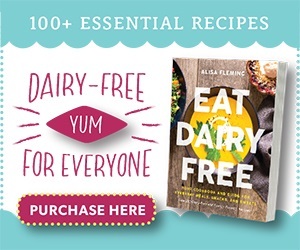 It’s also soy-free, carrageenan-free and made with short ingredient lists. I’ve included a brief summary and ingredients for all of the flavors, including the new Caramel. But don’t forget to leave your rating and review below of So Delicious Coconut Milk Creamer. We’ve updated this review post with our new rating system, and want to hear your honest opinion! Although there is some cane sugar added, this classic version isn’t very sweet at all. It comes in small pints and larger quart sizes. It performs well in coffee, adding just moderate richness, and in recipes. We even liked it for making dairy-free Panna Cotta and vegan Clafoutis! Notably sweet and bursting with vanilla, this flavor also comes in pint and quart sizes. This is one of my favorite cheats for sweet beverage recipes. I’ve used it to make White Chocolate Syrup for Mochas, Snickerdoodle Cold Brew, and Mango Melba Smoothies. 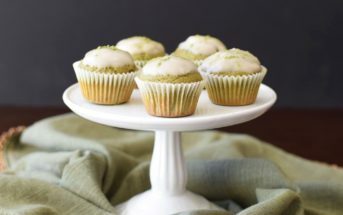 I’ve also used it with great luck in baked goods, like these easy Matcha Latte Mini Muffins. This flavor replaced their Hazelnut variety, and has a sweetness level similar to the French Vanilla. I’m guessing it will substitute nicely for the Hazelnut in coffee, and in Chocolate Mousse. But unlike the other flavors, you have to commit to the larger quart size with the Caramel. It isn’t available in pints. 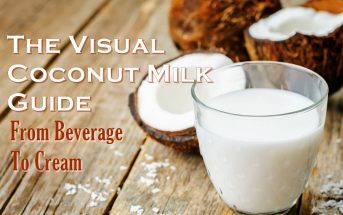 Availability: So Delicious Coconut Milk Creamer is sold in mainstream and natural food grocers across the U.S. Look for it in the refrigerated section with the other coffee creamers. 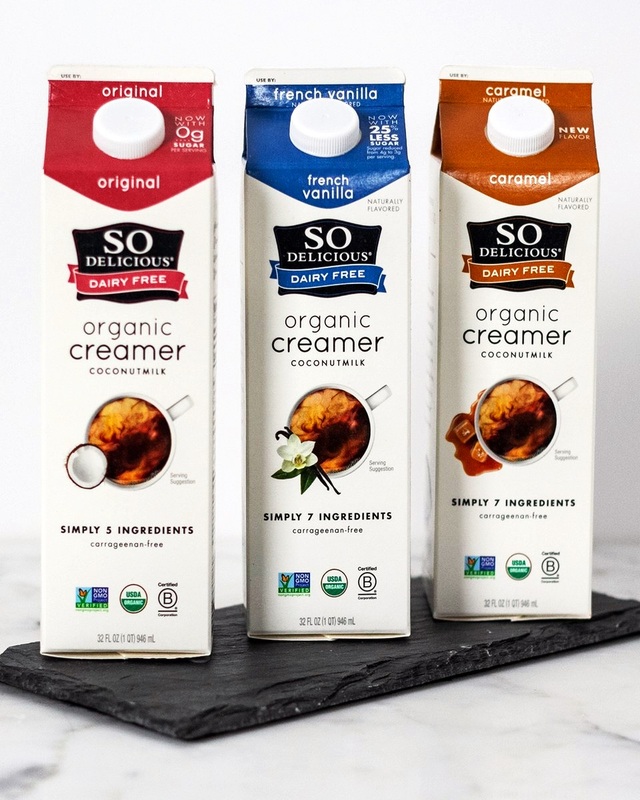 Certifications: So Delicious Coconut Milk Creamer is Certified Gluten-Free, Certified Vegan, Non-GMO Verified, and Certified Kosher DE (for dairy equipment, not ingredients; see our Understanding Kosher Guide). 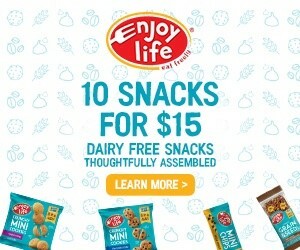 For More Product Information: Visit the So Delicious website at sodeliciousdairyfree.com. no sugar at all equals nasty taste! I was elated when I first found So Delicious coconut milk coffee creamer a year or so ago. It actually tasted GOOD! and the fact that there was less than a gram of sugar in it was a positive! But then, someone decided that NO sugar was better than that insignificant amount that was in there and took it all out. Now it is nasty. I have bought two pints of the stuff in hopes that I could find a way to continue to use it, but I’m going to have to give up because…even adding a whole spoonful of sugar did not help it the way I hoped it would, PLUS, I don’t want THAT much sugar in my coffee. Whoever came up with the NO sugar idea should be made to drink that nasty stuff exclusively until they understand that a little bit of taste is NOT a bad thing. Now I will go on the hunt again to find something that is palatable and dairy free that will go in my coffee. I do not like the flavored creamers. I got a french vanilla one to see if I could mix the two…but I do not like the flavored creamers. Oh, and, as some of the other reviews have noted, there really is a granular kind of stuff that stays on the bottom of the coffee cup. I’m ok with it usually, but sometimes it does get in the last sip of coffee and it makes it feel really weird. PLEASE…at least give us a choice! Make BOTH kinds if you must, but PLEASE, give us back the sugar/flavor! I even went so far as to buy 1/2 and 1/2 in hopes that I could use mostly the no-flavor coconut milk creamer that is far from delicious now and add just a touch of the 1/2 and 1/2 for the flavor. But even less than a spoonful of actual dairy milk is too much for my extremely sensitive system to manage. PLEASE put the tiny bit of sugar back in and give us a choice without us having to use an actual flavored creamer. Makes a delicious cup of coffee without any fake chemical taste. My new favorite to date! I love the original and use it daily. FYI- it foams amazingly in a Nespresso cappuccino milk foamer in seconds! I tried the Original flavor first. Although it does contain a little cane sugar, it was not sweet at all. However, after adding some liquid stevia drops, it was perfect. Rich, creamy, and slightly sweet. The French Vanilla creamer was great all on its own, but the Hazelnut …no thanks. It was way too sweet and tasted fake, even though it does not contain any artificial ingredients. I’m glad to hear they are replacing it with a new flavor. But I’ll probably stick with the Original since it is low sugar. The Original was surprisingly less sweet than expected, and very neutral in flavor. And despite its subtlety, there’s not a hint of coconut taste. It’s agreeable enough to pair well with any flavored coffee. On the contrary, the French Vanilla was quite sweet, and would be overkill if you added sugar to your coffee, too. But the floral vanilla essence makes its perfectly suited to fancy lattes. WILL BE TRYING THIS STUFF. I WOULD NOT GO TO ANY HEALTH FOOD STORE TO GET THESE PRODUCTS. FIRST LOOK IN YOUR LOCAL MARKETS, AND IF WORSE GETS TO WORSE, THEN I’D LOOK IN THE HEALTH FOOD STORES. HEALTH FOOD STORES ARE KNOWN FOR BEING OVERPRICED, SOMETIMES 21/2 TO 3 TIMES MORE THAN MARKETS/SUPER STORES. FOR THE VERY SAME ITEMS, JUST SO YOU CAN SAY “I BOUGHT IT AT A HEALTH FOOD STORE”? I discovered these creamers when I was nursing my milk protein allergic son. He is now 2 and I stopped nursing nearly a year ago, and I have never gone back to half & half. I love the flavor of the original but the french vanilla is too sweet for my taste. I stock up on the bigger shelf stable “barista” boxes when I can find them. I don’t think I will ever go back to regular cream. I have tried the hazelnut creamer. It is sweet but that is the way that I like my coffee. However, I liked it better when I added it to a cup of hot chocolate. Very yummy. I have trriedd these and thought they were quite good- then too, I like y coffee sweet and although they arent the ‘rrichest’ creamers tey had a nice taste and my coffee was great. I agree, it would be a very light creamer if you tried cooking with it. has anyone ever experienced any reactions when drinking the french vanilla creamee? I don’t know what if you’re talking about your own physical reactions, but it appears that they have changed their formula for the French Vanilla creamer for the worse. It used to take very little to produce a satisfying color, taste and texture in my coffee. Lately the effect is decidedly like pouring milk that has gone bad into my coffee. The product seems watered down and, after stirring it in, little specs of white float on the top just like curdled milk. Gross! I don’t know what they did, but I have called them and left a message. Hopefully they will call back. Has anyone else had this experience? I am having this same experience! Not even a month ago I loved the French vanilla creamer but all of a sudden it acts curdled! I have read that so delicious was bought by some major corporation and I’m wondering if that’s the problem. Have you tried the regular? I’m going to try it with my own sweetner and see if that helps. Very disappointed. Whitewave bought out So Delicious late last year. I contacted them too so hopefully I’ll hear back soon. They did, but it’s a wholly owned subsidiary – still the same people running the show, same ingredients, and same So Delicious. 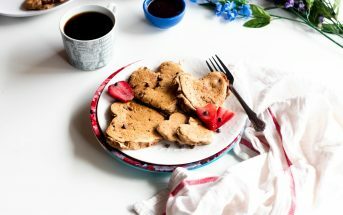 “We have been working on new recipes for our coconut milk coffee creamers so they will be titanium dioxide free and carrageenan free. We are in a bit of an awkward transition phase right now and are still working on the recipe. Fans asked for simpler ingredients and we are responding. Our first step has been to remove titanium dioxide, which is what you are noticing now. The only ingredient whitening our coconut milk coffee creamers is even more organic coconut milk. You may notice that our creamer doesn’t whiten your coffee the way it has in the past. Be careful not to over pour and use the same amount you have before. This may be somewhat confusing because it still says titanium dioxide on the packaging.” And so on. So it seems it’ll be different but hopefully they fix the problem eventually. 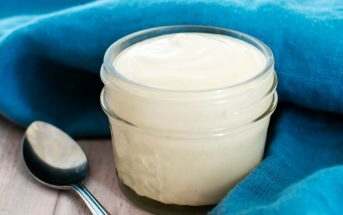 Can you use these creamers as a substitute for heavy cream in recipes? I would consider it more of a light cream substitute, but it would depend on the recipe in terms of how it would work out. Some heavy cream recipes work just fine with a light cream.